Hip arthroscopic surgery is increasing in surgery centers and hospitals. 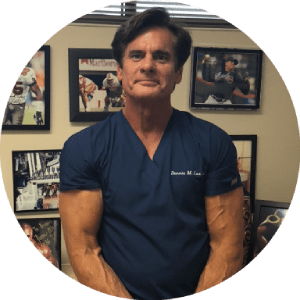 Conservative treatment alternatives such as Platelet Rich Plasma (PRP) and Stem Cell Therapy are becoming more aware to athletes with sports injuries as well as the patients with chronic hip pain and arthritis complaints. Hip arthroscopy has recently seen a surge in the procedures performed in the United States. More common knee arthroscopy has been performed for decades. Hip arthroscopy previously was felt to have very infrequent complications at 1.5 %. a recent study looking at hip arthroscopies performed by experienced surgeons in high volume practices noted complications at 7.2 %, much higher than initially reported. Complications included nerve injury most commonly. Blood clots were also cited. All surgery has complication rates. The surge in hip arthroscopies may have discounted the potential for complications. Conservative options for hip arthroscopic surgery include Platelet Rich Plasma (PRP) and Stem Cell Therapy. These Regenerative Medicine procedures focus on repair of tissues without surgical cutting or removing tissue. Surgical resection is a form of more joint trauma to an already injured or traumatized area. The more trauma the more potential for accelerating or developing post-traumatic arthritis. PRP and Stem Cell Therapy may provide healing opportunities without the complications of surgery or the risk of potentiating degenerative arthritis.